Doctor, What is baby bottle caries? Q: Doctor, Baby bottle (nursing bottle) can causes teeth decay? 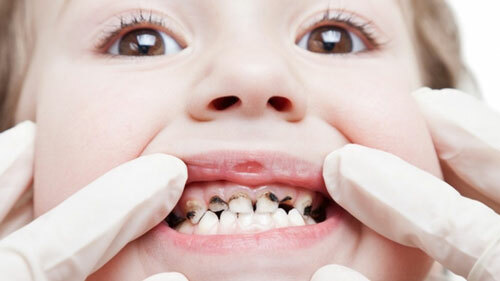 Baby bottle caries is one of the most common cause of Early Childhood Caries. Baby bottle tooth decay is caused by the frequent and long-term exposure of a child's teeth to liquids containing sugars. Among these liquids are milk, formula, fruit juice, sodas and other sweetened drinks. The sugars in these liquids pool around the infant's teeth and gums, feeding the bacteria in plaque. Every time a child consumes a sugary liquid, acid produced by these bacteria attack the teeth and gums. After numerous attacks, tooth decay can begin. The condition also is associated with breast-fed infants who have prolonged feeding habits or with children whose pacifiers are frequently dipped in honey, sugar or syrup.The sweet fluids left in the mouth while the infant is sleeping increase the chances of cavities. Q: Why should I be worried about baby bottle tooth decay? Giving an infant a sugary drink at nap or nighttime is harmful because during sleep, the flow of saliva decreases, allowing the sugary liquids to linger on the child's teeth for an extended period of time. If left untreated, decay can result, which can cause pain and infection. Severely decayed teeth may need to be extracted. If teeth are infected or lost too early due to baby bottle tooth decay, your child may develop poor eating habits, speech problems, crooked teeth and damaged adult teeth. Healthy baby teeth will usually result in healthy permanent teeth. Some kids will have to undergo removal of multiple teeth in surgery operating theater. I'm sure as parents, you wouldn't like to see your kids to suffer with this. Q: How can I prevent baby bottle tooth decay? Never allow a child to fall asleep with a bottle containing milk, formula, juice or other sweetened liquids. Clean and massage the baby's gums to help establish healthy teeth and to aid in teething. Wrap a moistened gauze square or washcloth around the finger and gently massage the gums and gingival tissues. This should be done after every feeding. Start brushing your baby teeth after they get their first tooth. When brushing a child's teeth, use a soft toothbrush and water. If you are considering using toothpaste before your child's second birthday, ask your dentist first. Bring your baby to dentist on his first birthday! "First visit by first birthday." Q: How to make changes in my child's diet in order to help prevent baby bottle tooth decay? Gradually dilute the bottle contents with water over a period of two to three weeks. Once that period is over, if you give a child a bottle, fill it with water or give the child a clean pacifier recommended by a dentist. The only safe liquid to put in a bottle to prevent baby bottle tooth decay is water. Decrease consumption of sugar, especially between meals. Children should be avoid from the bottle as soon as they can drink from a cup, usually by their first birthday, but the bottle should not be taken away too soon, since the sucking motion aids in the development of facial muscles, as well as the tongue.